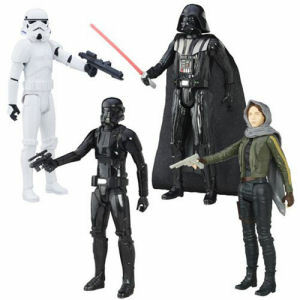 We have Just Sold out of Star Wars Rogue One Hero Series 12 Inch Action Figures Wave 2 Case. Not to Worry! Fill in the Notify me When Available and you will be the first in line for our restock of Star Wars Rogue One Hero Series 12 Inch Action Figures Wave 2 Case !! From the Star Wars Rogue One collection by Hasbro. Star Wars Rogue One Hero Series 12 Inch Action Figures Wave 2 Case. Case includes 8 individually packaged figures - 3 SERGEANT JYN ERSO JEDHA - 2 CAPTAIN CASSIAN ANDOR EADU - 1 IMPERIAL STORMTROOPER - 1 IMPERIAL DEATH TROOPER - 1 DARTH VADER. Action figures have 5 points of articulation and measure 12 inches tall.